The Real IRA has admitted it was behind a car bomb which exploded outside the army base which houses MI5's Northern Ireland headquarters. The blast came on the day that David Ford was elected as NI's Justice Minister, the first local politician to hold the job in 38 years. It happened at about 0020 BST outside Palace Barracks, in Holywood, County Down. Police said no warning was given. The bomb went off as the surrounding area was being evacuated. An elderly man walking near the barracks at the time was treated for minor injuries. The bomb was placed in a taxi, which had been hijacked in the Ligoniel area of north Belfast, about seven miles from Holywood, at about 2150 BST. The driver was held hostage by three men for about two hours before being told to drive his taxi to the barracks. The vehicle was abandoned at the base just before midnight prompting police and security staff to evacuate the area. The bomb exploded about 20 minutes later as the evacuation was still taking place. 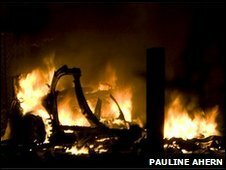 There were two explosions - first the bomb and then the petrol tank, destroying the car and damaging other property. Mr Ford, the new justice minister, said the bombing was a cynical attempt to intimidate politicians ahead of Monday's vote. "Those who carried out last night's attack will not be allowed to succeed in sowing dissension, distrust and disharmony," he said. Chief Constable Matt Baggott said the people responsible for such attacks would have to be locked up and put through the criminal justice system. "My hope is that many people will be persuaded by their families and their communities that this is no longer the time for this, it's gone, the war is over," he said. Chief Superintendent Nigel Grimshaw said the police had not received a telephoned warning about the attack. He said the taxi used was destroyed in the "significant explosion". The senior officer visited the scene on Sunday night. "I saw young children in the arms of mothers and fathers, where we had moved people into a local community centre - that's the type of people who were affected by this totally callous act. "There is no question in my mind that it was designed to kill or seriously injure and that's exactly what would have happened, were it not for the actions of my officers, military colleagues and indeed the community themselves who co-operated fully with us." Up to 60 people were moved from their homes and spent the night in a community centre. All have now been allowed to return. The attack appears to have been timed to coincide with the transfer of policing and justice powers from London to Belfast. Northern Ireland Secretary Shaun Woodward said this "democratic transition stands in stark contrast to the activity of a criminal few who will not accept the will of the majority of people of Northern Ireland". "They have no support anywhere," he added. The timing and location of the bombing were designed to try to create the biggest possible international headlines and the deepest political impact. 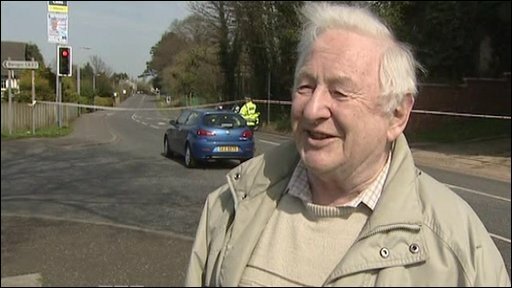 Planting the bomb three miles from Stormont, and outside the army base which houses the headquarters of MI5 in Northern Ireland, was deliberate. And making it explode shortly after midnight, less than an hour after policing and justice powers were transferred from London to Belfast, was a key part of the potentially lethal plan. On a day when a new political era is starting at Stormont, dissident republicans wanted to highlight one of the weaknesses of the peace process - the threat of further violence. The truth is the police suspected something might happen this week. The reality is that they were not able to stop it. That will be food for thought for Stormont's new justice minister. What happens after powers transfer? In March, Northern Ireland Assembly members voted in favour of the transfer of policing and justice powers. Out of the 105 votes cast in the Assembly, a total of 88 supported the move, with 17 Ulster Unionists voting against. Disagreement on the timing of the devolution of the justice powers had threatened to collapse Northern Ireland's power-sharing administration. On Monday, Stormont assembly members voted to make David Ford, the leader of the cross-community Alliance Party the justice minister. His department has taken over responsibility for many functions and agencies previously controlled by the London-based Northern Ireland Office. As well as taking over responsibility for the police, the new ministry will oversee bodies like the Northern Ireland Prison Service, the prosecution service, the Probation Board and the forensic science service. Are you in the area? Have you been affected by the car bomb, and the evacuation? Send your comments using the post form below.